Westminster College is accredited by the Middle States Commission on Higher Education, 3624 Market Street, Philadelphia, PA 19104, (267-284-5000) www.msche.org. The MSCHE is an institutional accrediting agency recognized by the U.S. Secretary of Education and the Council for Higher Education Accreditation (CHEA). The School of Music is accredited by the National Association of Schools of Music. Additionally, the chemistry program is approved by the American Chemical Society, and the School of Education’s teacher preparation programs are approved by the Department of Education of the Commonwealth of Pennsylvania. For information about the College’s accreditation and reports, please contact the Office of Academic Affairs (acadaff@westminster.edu), or Dr. Jamie G. McMinn (mcminnjg@westminster.edu). The purpose of assessing student learning is to improve student learning, not merely to satisfy our accrediting bodies. The results of assessment should be used to improve student learning rather than to restrict academic freedom or to evaluate faculty and staff performance. Assessment must be clearly linked to Westminster’s mission and outcome statements, which include departmental missions and outcome statements, and the College’s liberal arts heritage. The results of assessment will be used to improve institutional effectiveness through strategic budgeting and curricular planning processes. Assessment is an ongoing, routine function—not a one-time event or an end-point in the College’s assessment cycle of Plan, Do, Check, Act. Effective assessment requires shared responsibility and generous participation from all college constituents. The results of assessment should be shared with college constituents and the community. Trustees, the President, Cabinet, and others who lead the College must support assessment activities. Assessment activities must be supported with appropriate financial and human resources. Effective assessment relies on varied methods and measures, including quantitative and qualitative measures and direct and indirect evidence. Effective assessment is reasonable, cost-efficient, and appropriate for Westminster and its departments. 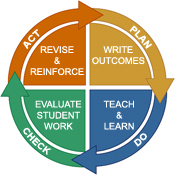 Assessment activities themselves require routine assessment.